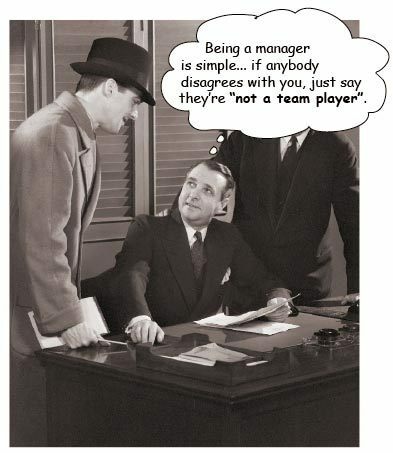 It’s not teams that are the problem, it’s the rabid insistence on teamwork. Group think. Committee decisions. be to act as a supportive environment for a collection of individuals. ideas, not get in lock step to keep everything cheery and pleasant. This comes from, of all unlikely places, the blog of an author of textbooks on Java. But the more important clue is in the title – Creating Passionate Users. the picture shows the obviously essential team player behind the speach bubble. An obvious example that behind every good manager there is a bl**dy effective team (we just don’t always know who they are). I think this morning’s conversation went well and was an opportunity to gain an insight into others’ issues and to plant seeds for working more closely together. Linking to the staff survey there has been a culture of if you can’t get the work done work longer and harder. As effective as we are individually I’m sure there’s a place in knowing that if you’re sinking there are some friends out there who’ll help you out of the water or at least help give you energy to keep swimming. Our approach to date (this room, the IT problems discussion and the 15 minute meeting) shows we are approaching this task in manageable steps. The problem with diving into a big team build is often that you identify sufficient desirable actions to keep the team busy all year and of course real work doesn’t allow for that. I am getting a really comfortable feeling from this approach and perhaps we should look at getting what benefits can be had from working with/involving people from Louise’s team. My conclusion from the picture is that team members are male – but I’m glad to say we’ve moved on from then….a bit. I do think it is imporatant that we encourage individual/off the wall ideas in each other (possibly another subject for a more substantive dicussion?). It would be easy for us to establish a shared set of thoughts that we can sit around agreeing on. I, for one, would happily welcome challenges to anything that sounds like it is getting dogmatic or we start thinking we’re right because collectively we’ve said something often enough. By which I mean lets encourage a team culture of challenging and questioning rather than consensus finding. Just being able to have a rant and know that it will be accepted as just that is for me one of the major success indicators of a team – and like other commentators I think we moved a long way in a short time. I wouldn’t want us to try to boil the ocean when we don’t need to, but I would want us to keep the challenge going where it makes sense to do so ….and John / Stefan I’ll be challenging your views on using powerpoint to create documents when I finish the current powerpoint document I am drafting!